The first time you refill a cartridge, don't get discouraged if you get some ink on your hands. After your first time you will quickly learn to avoid this problem. If you do get some ink on yourself, simply use a mild bleach and water to remove it. This will clean the ink off your hands. Wash with soap and water when you are finished with the bleach. Don't let your cartridge dry out. The number one refilling problem is a dried out cartridge. If your cartridge is left empty for more than 1 hour, the ink will dry and clog the micro holes at the outlet of the print head. When refilled, your cartridge may produce a sub-standard print quality such as streaks or dull output. If your cartridge has been empty for a few days and not properly stored, we suggest that you throw the cartridge away, buy a new one along with a refill kit so you can refill it as soon as it get empty. Another way is to place your empty cartridge into a ziplock bag with a damp cloth to keep the cartridge moist untill you can refill it. The best way to keep your printer running is to have a backup cartridge. Keep the backups filled. When the one in the printer goes empty, put in the backup. Then refill the empty as soon as possible. Store in a zip lock bag with a damp cloth until you can get to it. If you do a lot of printing, you can "top off" your cartridge. By knowing how many pages your full cartridge can print gives you a mental signal to "top off" when you reach the 3/4 empty point. Some of the cartridges are "see thru" so you can fill them when they are not quite empty. Bubble jet cartridges have electrical resistors that control the current to each outlet jet. These resistors must stay fixed in terms of their resistance or ohms. When they get over heated the resistance changes. After many over heatings the resistance value may not be in the acceptable range and this will present itself as low quality output, either color distortion or weak printing or both. The ink in the cartridge keeps these resistors cool and prevents over heating, like oil in an engine. However, when the cartridge goes empty and the printer continues to try to print, over heating occurs. If you continue to try and print, each time the cartridge will suffer damage and eventually burn out. This is why cartridges have a limited life in terms of how many times they can be refilled. Each time there is a no ink situation and the resistors overheat the life of the cartridge is diminished. The remedy here of course is a new cartridge. 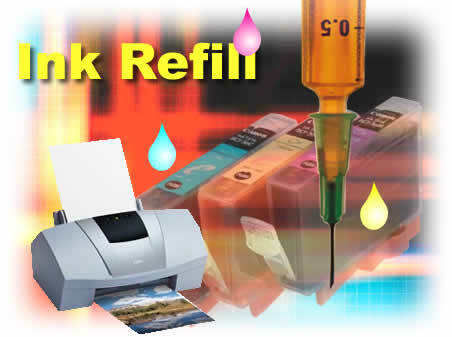 To extend life, refill your cartridge at the first sign of low ink or do the "top off" procedure above. When you shoot ink into a cartridge it upsets the internal pressures in the cartridge. When the cartridge is full, let it set on some newspapers or in a plastic container for 15 minutes or more before putting it back into your printer. This will give the cartridge time to stabilize internally. The excess ink will drain off and the chambers inside will reach equilibrium. Wipe off the print head with a paper towel or cloth and reinstall or put into a zip lock bag for storage. Note, some cartridges, like the HP51626A/HP51629A require about an hour to stabilize. When you are refilling an HP51626A/HP51629A, it will leak out the head quite heavily at first, until it starts to fill up. Thats because there is badder in the cartridge that has to become presureized before it will stop leaking. This is not a problem with SaveOnCartridgePlus. Empty cartridges that are unwrapped and not installed in the printer will dry out and may become clogged. Never let a cartridge dry out completely, even if it is out of ink. If you don't have any ink, wrap it in a moist towel and seal in a ziplock bag for storage. If you have ink, refill it and seal it in a plastic bag or put it in the printer's spare slot, if it has one. If you have a cartridge that you have tried everything on, don't throw it away yet. There is one more thing to try if you have the patience. Put the totally clogged cartridge in a shallow dish or saucer. Pour boiling water into the saucer so the ink jets are covered. Let is set for 2 minutes or until ink begins flowing out of it. Do this again if it is still clogged. The hot water will eventually destroy the cartridge if you do it too many times. Be careful not to burn yourself. Trouble shooting, helpful hints and changing color. Cartridge leaks: The cartridge has lost pressure or was not properly pressureized. Follow the repressurizing procedure in method 2. Stand the cartridge upside down until you are ready to pressureize. Cartridge will not leak as long as it stand upside down. Cartridge will not print at all. The Cartridge has an air lock near the print head. Using the injector with the small hose, inject a little air into the top vent hole keeping the cartridge in the upright position. Do this on a paper towel to catch any ink coming out of the print head. Cartridge prints in streaks or unevenly. Some of the microscopic nozzle holes are clogged with dried ink. Soak the print head in a 50/50 mixture of ammonia and water for 5 to 15 minutes, then using the syringe and hose again, push air into the top vent hole. Again do this on a paper towel to catch ink coming out of the print head. If after repeated attempts at trying to clear the print head without proper results, you should assume the cartridge is defective and discard it. · Do not puncture the top center hole as this will destroy the check valve inside and make the cartridge useless. · The cartridge will leak if it undergoes pressure changes during air line flights. Remove cartridge from printer and store in a zip lock bag while traveling. Changing color: Changing color in the HI-Capacity cartridge is easy. After pushing the white ball in the top corner into the cartridge, simply inject water instead of ink, shake and pour out the fill hole. Do this several times until the water comes our fairly clear, and inject the new color. Cartridge is overfilled. Set it on a paper towel until the leaking stops. Reinstall print cartridge or clean copper contacts with plain water and dry with a soft tissue. Clogged, dirty, or damaged print head.Soak the cartridge in just enough simmering water to cover the print head for about 5 min. Add about 50% ammonia for tough cartridges and always perform the cleaning procedure from the front of the printer.